Within this title, we include after decorators and/or builders work has been completed, or end of tenancy cleans, or just annual/bi annual ‘springclean’ of your home. In this instance, there are usually multiples of either 2,3 or 4 cleaners included to carry out the necessary work, and all cleaning materials are provided by the Agency. 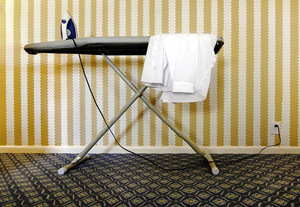 Ironing services are included in the general domestic chores and timing should be taken into account for this. However, if ironing is required to be taken from the home and carried out in the operative’s own premises, this will be charged additionally on an hourly rate. Thank you so much for Michaela. She has made my life my own again. I tried to cover my housework as well as working full time, but it was just too much for me. She has been a total blessing to me - long may she stay! Flori is a delight to me and my wife - she keeps our home inpeccably clean and tidy. That's no easy matter with 3 children, a cat and dog! I've always had courteous service from 1st Call and any replacement cleaner in Flori's absence has been wonderful. Adwoa's work is so good that even through she's going away for 2 weeks, I'd rather manage without a replacement - it would be hard to find someone equivalent! I have been completely satisfied with the professional and polite service from 1st Call, and the standard of work performed by my cleaners. Our cleaner, Lilli, has been wonderful. She does a wonderful job and is delightful to have in our home.